"Deep change requires open mind & open heart; it demands to look deeply within at all levels: I(me), We(team), Us(org)." The DeSai Group takes the time to find out exactly what your organization needs to gain a competitive advantage through innovation. This is done at each step of the process including initial consultation, diagnosis, presenting feedback, and measuring critical success factors. We will partner with your staff to establish a baseline understanding about innovation and help you connect it to business strategies. This will help create the proper space needed to harvest larger opportunities for innovation in the future. 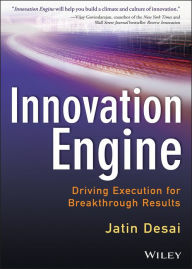 Once your organization commits to the establishment of an innovation foundation, The DeSai Group can provide specific tools, frameworks, innovation training, and consulting to accelerate your success in developing new market entry strategies. As you begin to build strength with respect to business innovation, we offer knowledge transfer services and certifications so your internal staff can become experts in our tools and methodologies.